Believe it or not, your landlord was once a student just like you. I lived in Uni residence for three of my four undergraduate years, and moved into a shared apartment during my fourth year. After graduating, I continued to live the share house lifestyle for four years. During this time, I came to appreciate the importance of cooperating with my housemates for maximum mutual benefit. 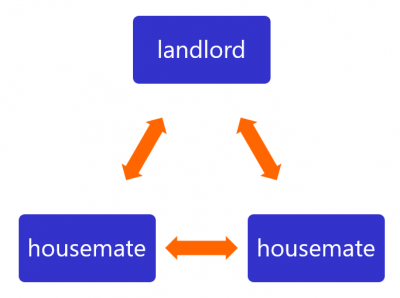 I also learned the difference between personal space and communal space, and the need for respect and tolerance in a three-way compact between one housemate and the next, and between each housemate and the landlord. 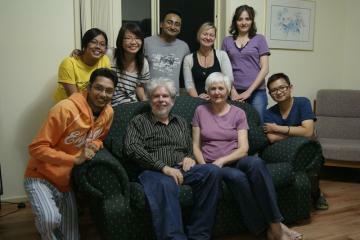 Mr and Mrs Landlord were recently honoured to be invited to dinner by the Mawson Lakes housemates. No two people in the photo (including the landlord and his wife) are from the same country, and we enjoyed a wonderful evening sharing stories from all over the world! A commonly held perception of student accommodation is that anything will do as long as it’s cheap. UNIShare was established with the objective of countering this stereotype by providing affordable accommodation without compromising quality. To that end, we sought out modern houses with generous indoor and outdoor living areas, and superior indoor facilities (integral heating and cooling, good kitchen and bathroom facilities). We engaged cleaning and gardening contractors, and decided to take care of utility bills and internet connection ourselves, to relieve students of the management of these responsibilities, which are often a source of tension in shared accommodation. We kept the operation small enough to be personally managed by the landlord. Our residents’ concerns, and their welfare, matter to us, and they never have to deal with disinterested employees as might be encountered in a larger organisation. UNIShare was motivated to facilitate independent living, but with the capacity to provide support when needed. Housemates know that the landlord will not be “in their face”, but they can call anytime they need support. Indeed, the establishment of UNIShare has brought with it a mentoring aspect which was not anticipated, but has made the enterprise all the more worthwhile. Read testimonials from our former residents or return to the home page to see all on offer. If you have any questions, please get in touch via the contact form.